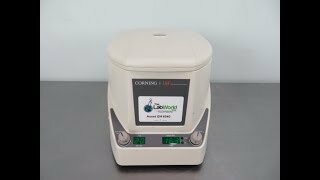 The Corning LSE High Speed Micro-centrifuge provides users with an easy to use, high speed centrifuge that is convenient to place where you need it most. This mini centrifuge is operated with two analog control knobs and allowing users to precisely dial in their desired runtime and speed on the digital display. This microcentrifuge features quiet and cool operation thanks to the brushless drive and air-cooling system that reduces sample heating even when used at maximum speed for long periods of time. The LSE High Speed Microcentrifuge has a maximum speed of 13300 RPM and RCF of 16999 x g and will hold 24 x 1.5/2ml in the fixed angle rotor with lid. This Corning LSE High Speed Micro-centrifuge has been fully inspected and is performing without issue. All our lab equipment comes backed with our standard warranty. Should you have any questions, please don't hesitate to contact us.